What not to buy dan for xmas. 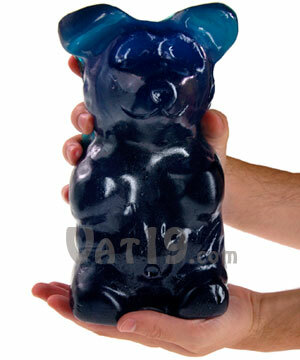 The World's Largest Gummy Bear. Only $30. DO NOT WANT. Although you get free shipping if you spend over $99, which means you only need to buy four of them - one in each color and an extra backup blue one! You can also get them on a stick, which seems very awkward and just a tad perverse. This is hilarious, intriguing and nauseating! distgusting????? no way! I ordered 6!!!!! Imagine, you can curl up in bed with a teddy you can nibble at and lick!